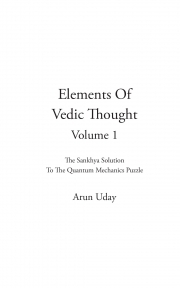 Description of "Elements Of Vedic Thought Volume 1 (eBook)"
Ever since the inception of modern science, the course of progress that it has traversed is one that has been increasingly divergent from religion. As a result, it is now believed that science and religion are fundamentally opposed to each other. The reason for this is that as science has unearthed more and more of nature’s laws, it has penetrated deeper and deeper into the causal forces that operate therein. As such, most people now believe that religion (which purports a transcendent cause to nature) is a redundant institution insofar as the rigorous description of the universe is concerned. Further, the technological benefits that have accrued as a result of scientific progress as also the inability of religion to objectively defend its own tenets in the wake of the scientific march of knowledge have only further weakened its stature and precipitated its intellectual downfall. This work is a humble attempt to arrest and even reverse this seemingly inexorable trend. The approach adopted here is to pick on some of the most important fundamental unsolved problems within physics and propose scientific solutions to the same based on the Hindu texts of knowledge, a.k.a. the Vedas. In so doing, it is argued herein that the reason that these problems within physics have remained unsolved despite the best scientific brains engaging on them for over a century is that there is a fundamental misconception of causality within science. The contention here is that physics is an effectual study of matter in that it only predicts the sequence of effects without needing to explain the causal basis for them. Therefore, the proposed solutions to these problems have been derived based on the causal theory of the Vedic physical sciences (a.k.a. Sanhkya), which is also inherently amenable to the theistic school. In this way, the deep intellectual conflict between science and religion is attempted to be resolved. It is hoped that this should lay the foundations of a new science that is not in fundamental conflict with religion and result in a more harmonious coexistence of these two great intellectual institutions. Arun Uday holds an ME (Integrated) degree from IISc, Bangalore and an MBA from ISB, Hyderabad and currently works in a private equity firm in Mumbai. He has been studying Vedic philosophy for over two decades. Reviews of "Elements Of Vedic Thought Volume 1 (eBook)"